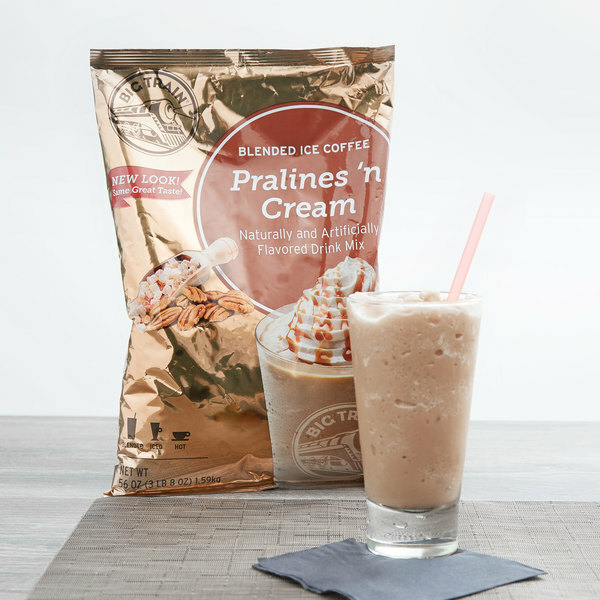 Offer irresistible flavor in your coffee beverages with this Big Train pralines 'n cream blended ice coffee mix! With a name symbolizing strength and constant motion, Big Train has expanded into a global foodservice brand you can trust with a large number of diverse products to choose from. Big Train has become a leader in the specialty beverage mix industry, delivering easy-to-make and consistently-delicious products. Made from nuts and sugar, pralines are generally a nutty, fudge-like confection. This praline-flavored drink mix is a smooth blend of praline pecans with cream and a hint of vanilla. Featuring a nutty, caramel-like taste, this drink mix also features robust Arabica coffee. Give your guests an energizing caffeine boost with signature coffee drinks that can be served hot, iced, or blended! Better yet, your guests can rest assured that this drink mix is gluten free, trans fat free, and contains no hydrogenated oil. I keep these mixes on hand for FRG meetings and other gatherings in my home. The ladies love the pralines n cream frappe with an added shot of espresso. Ive been told multiple times they are better than the pricey ones at our favorite local coffee spot. The kids have them without espresso and say they taste like milkshakes. I like to top them with whipped cream and a little caramel or butterscotch syrup. This is one of the favorite flavors in my store. Paired up with espresso and it is good too. I like it just as it is though. 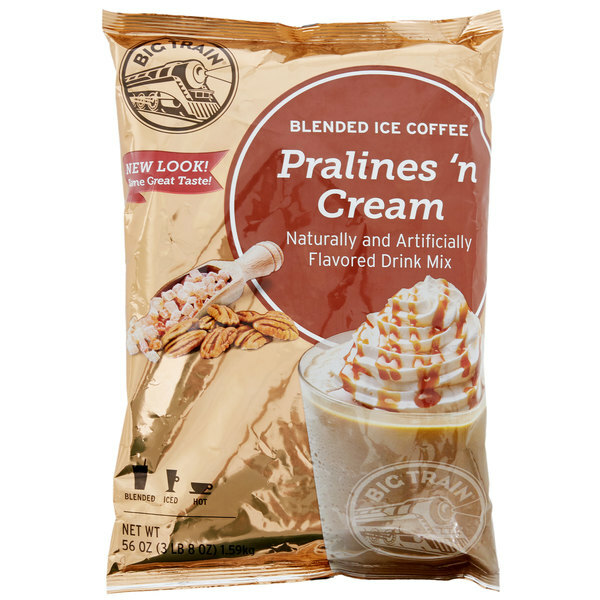 The Big train pralines "N cream blended ice coffee mix is caramel and nut goodness. The mix is a great specialty mix and tastes amazing. Our customers love this blended coffee and remark on how much it tastes like ice cream! Super easy to make with ice, milk or water and a good quality blender.